Line an 8”x 8” baking dish with parchment paper and spray with non-stick cooking spray. Combine the oats, breakfast cereal, dried cranberries, pumpkin seeds, and spices in a bowl. In a separate bowl, combine the sweet potato, egg, and honey or brown sugar, if using. Add the dry ingredients to the bowl with the sweet potato mixture and gently mix together until the sweet potato mixture appears to be well distributed. Press the mixture into the prepared pan, and bake for 15-20 minutes, or until the top is brown and firm. Once cooled, remove the granola bars from the pan and slice into 12 portions. Looking for the perfect healthy on-the-go snack? This quick and easy homemade sweet potato granola bar recipe is a great source of protein, vitamin A, vitamin C, manganese, magnesium, and dietary fiber. 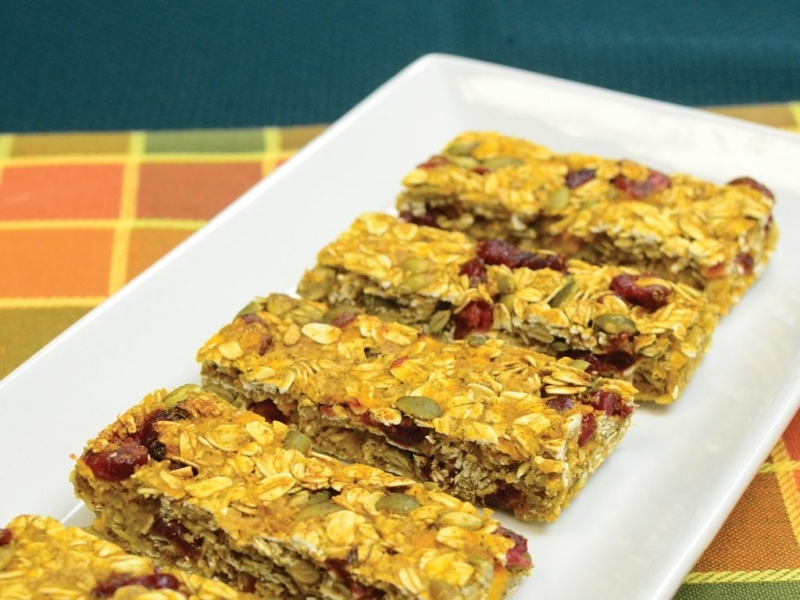 Additionally, these bars contain all natural fall ingredients, and they’re kid friendly.